SRML is a modelling language for service-oriented systems developed by the IST-FET-GC2 Integrated Project SENSORIA. SRML operates at the higher levels of abstraction of business modelling, i.e. it provides a number of semantic modelling primitives that are independent of the languages and platforms in which services are programmed and executed. 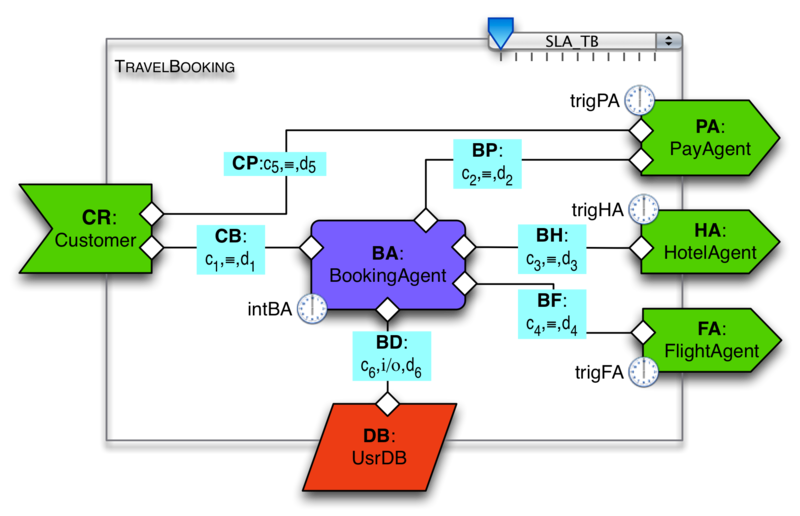 In particular, SRML abstracts from the typical mechanisms made available by service-oriented middleware such as sessions and event/message correlation, as well as the brokers that are responsible for the discovery and binding of services. A formal computation and coordination model was developed for SRML over which qualitative and quantitative analysis techniques were defined using the UMC model checker and the PEPA stochastic analyser. An algebraic semantics was also developed for the run-time discovery, selection and binding mechanisms. Finally, methodological aspects of engineering business services and activities were investigated, which were supported through extensions of use-case and message-sequence diagrams and tested over a number of case studies. L. Bocchi, J. Fiadeiro, S. Gilmore, J. Abreu, M. Solanki, V. Vankayala (2009) A Formal Approach to Modelling Time Properties of Service-Oriented Systems. In: Handbook of Research on Non-Functional Properties for Service-Oriented Systems: Future Directions. Advances in Knowledge Management Book Series. IGI Global. J. L. Fiadeiro, A. Lopes (2012) An Interface Theory for Service-Oriented Design. Extended version of the FASE'11 and FASE'12 papers. Submitted. J. L. Fiadeiro, A. Lopes (2012) A model for dynamic reconfiguration in service-oriented architectures. In: Journal of Software and Systems Modeling, in print. (Extended version of the ECSA'10 paper - best paper award). A Formal Approach to Service-Oriented Modelling:	A 3-hour tutorial given at the Bertinoro School on Formal Methods in 2009 (and other places). It is available as a pdf file and a movie. Service modules and exercises on business roles and business protocols. Enter the following update site. Author: José Fiadeiro (jose at mcs.le.ac.uk), T: +44 (0)116 252 3887.